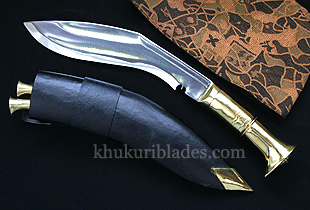 This is the new version of the very popular village kukri “Angkhola”. Liked by many as a great working kukri is now made with a brass handle. This is the new version of the very popular village kukri “Angkhola”. Liked by many as a great working kukri because of its good weight behind the blade, is a great chopping tool when it came for chopping things down. This kukri is crafted in such a way that a layer can be seen known as “Ang” and to craft it down is “Khola”, so why the name. The extra layer shows more craftsmanship of the maker and also believed to give the blade the additional weight to improve its effectiveness. This Angkhola is given a Brass handle for better look and longer lasting handle. To use a Brass Angkhola requires leather gloves and to decorate one, needs to be left clean and untouched to avoid tarnishing. Brasso liquid to polish the brass if tarnished.